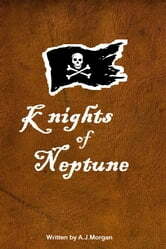 The Knights of Neptune is a tale of Pirates and Treasure quests. Suitable for readers aged 12 yrs and up. Follow Pirate Captain Zino and his crew of Pirates, as they go on swashbuckling pirate adventures around the Mediterranean. They travel far and wide, sailing in the mighty Pirate ship the Serafina battling with rival pirates, and discovering hidden treasures along the way. Set in the 16th century during a Golden age of Pirates, this is a fun swashbuckling Pirate adventure book worthy of being on anyone's e-book list! 1. The 'Golden Owl' Adventure. Sardinian Pirate Rolando steals the golden owl of San Marino. Corsican Pirate Captain Zino and his crew give chase and try and retrieve it. Epic battles, pirate combats and a chase around the islands of Sardinia and Corsica in an action packed swashbuckling Pirate adventure. 2. The 'Griffin's Dagger' Adventure. Corsican Pirate Zino hijacks a Genoese Merchant ship the Mirabella, and discovers an ancient old treasure map hidden in a wooden trunk in the ship's storeroom. He sets off to try and find the hidden treasure, following the ancient map and travels to the Black Sea off the Georgian coast. Epic battles against Black Sea Pirates and a quest that takes him and his crew deep into unchartered territories. 3. The 'Racehorse of Ragusa' Adventure. Pirate villain Captain Sharptooth and his band of Pirates steal a prize racehorse intended for the Palio horserace of Siena in 1583. Corsican Pirate Zino tries to help the original owner get it back. An action packed adventure as Zino and his Pirate crew give chase to Sharptooth across Italy and the Adriatic sea. 4. The 'Amulet of Aurora' Adventure. Corsican Pirate Captain Zino goes on a quest to the Stromboli islands off Sicily to retrieve a mystical amulet. When they arrive there they get more than they bargained for. They meet the sea witch of Stromboli, who puts them all under a curse. Captain Zino gets given 3 tasks to complete to try and get his ship and crew back alive. 5. The 'Great Sea Heist' Adventure. Corsican Pirate Zino and his fellow pirates attempt to hijack a Spanish Galleon convoy full of gold dubloons as it travels from Spain to Sardinia. The Spanish convoy has nine ships in total, under the guard of Spanish Admiral Diego Gutierrez, a.k.a Diego the Terrible (Diego el Terribile). It would be the biggest and boldest sea heist ever attempted in the 16th century. Thats if he can manage to pull it off. A very bold and ambitious plan... but will he succeed ?